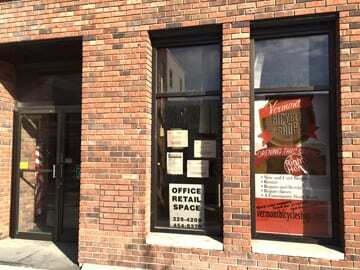 This space located at 105 N. Main Street in Barre, will be the future site of the Vermont Bicycle Shop this spring. By this coming April, Barre will be home to the Vermont Bicycle Shop. Owner Darren Ohl has experience working at bicycle shops in nearly every corner of the United States – a passion that formed as a child. While he’s dreamed of opening up his own shop for years, he doubted it would become a reality. But once he and his wife, Ginger, moved to Barre, he knew it was time. The couple moved to Vermont in April of 2014 from Eugene, Oregon, and soon thereafter, Ohl bought the domain name vermontbicycleshop.com and registered as an LLC with the state. Initially, he considered options in the Vergennes area, but his wife found a job in Barre, setting the stage for Ohl to meet Pavel Cherkasov, owner of the Magic Wheel Bike Shop near the Millstone Trails in Websterville. Cherkasov planned on closing the store for a year, while he worked for a pro cycling team, but Ohl convinced him to let him run the store and split the profits instead. The relationship grew as they discussed moving the shop to a more accessible location, and eventually Cherkasov decided to sell the Magic Wheel to Ohl. “That’s when I knew it was time to do the Vermont Bicycle Shop full on,” Ohl said. Admittedly, Ohl’s feelings about the venture have fluctuated between excitement and fear; although excitement has won out now that he has closed on a location at 105 N. Main St. near Goodfellows. Naming off examples such as Copy World, Bob’s Camera & Video, and The Office Block, Ohl, 36, hopes the Vermont Bicycle Shop will be another successful Granite City business run by younger adults. Ohl plans to cater to everyone from kids needing their first bikes to those looking for the latest high-end offerings because Ohl has experience working on all types of bikes. But Ohl wants to create a bike shop like one you’ve never seen. First, transparency is very important to Ohl. In the past, he’s broken down the costs of bike repairs by the part, so people know what they’re paying for and they can replace a broken part under warranty at any store. He also won’t hide the mechanics. They will be right there for people to watch as they work since he believes that’s the most interesting aspect of a bike shop anyway. Ohl said he plans to offer 3-D printing services of custom parts, up-to-date inventory listings on its website, and the ability to purchase a bike online and pick it up in the store. With financing lined up, a location, and a grand opening scheduled for April 1, 2016, the business is going to happen. But Ohl started a Kickstarter campaign in order to raise $10,000, which will allow him to provide extra services to the community such as: free local delivery, as well as a community work bench, so people can come in and work on their bikes during a month long comprehensive class. Ohl hopes that a version of the class can eventually be offered to high school students for free. Ohl’s shop will also only sell its own line of clothing, and the Kickstarter campaign will help cover the upfront costs of printing the clothing. However, this clothing line comes attached to a good cause. Each bicycle jersey will have the logo of a local non-profit or charity. A portion of the proceeds from the jersey sales will go to those respective organizations. Giving back to the Barre community only makes sense considering how quickly Ohl felt Barre was the perfect place to settle—with its combination of small town charm and amenities, including the Millstone Trails, of which Ohl is a Board member. There is still some work to be done in order to reach the goal of the Kickstarter project by the Dec. 6 deadline. Ohl said he would appreciate any help. Every dollar helps because if the goal isn’t reached, the money isn’t paid out. There are also rewards depending on the level of pledge. For more information on the Kickstarter, check out it out here.